Recruitment and retention of this crucial workforce is at high risk due to an extremely low base wage, no benefits, increasing demand, and alternative employers paying much higher wages. 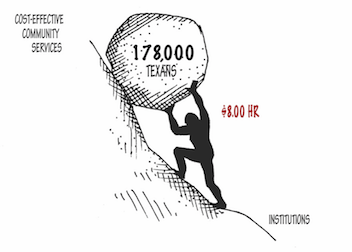 The Texas Health and Human Services Commission (HHSC) requested funds for a $.50 per hour raise for the lowest paid attendants in 2019 (HHSC LAR Exceptional Item #36). However, the Legislature must go beyond this minimal increase to create adequate pay and ensure reliable attendant care. We recommend an increase in the base wage of $8.00 to $13.00 per hour over the biennium. April 12: The House has included funds for a 10 cent raise for attendants in their budget, while the Senate has funded NO raise in theirs. Take action: tell key legislators that attendants need a meaningful raise to continue to support the health and independence of Texans with disabilities and seniors. March 5, 2019: ADAPT and the PACT Legislative committee have found that the Texas House Subcommittee on Article II of the state budget has put the equivalent of a 10 cents per hour raise toward Community Attendant base wages. Remember the base wage is $8 per hour. This is a terrible start to address the need for Community Attendant recruitment and retention. Take action. After decades of advocacy and changing attitudes, people with disabilities and seniors are better able than ever to be active in their communities and contribute to society. Part of this progress is due to community attendants, who assist their care-recipients with a wide variety of daily tasks in their own homes, allowing them to avoid unnecessary, expensive hospitalization or institutionalization. Community attendants are the key to making cost-effective community services successful for approximately 178,000 individuals with disabilities and seniors in Texas, but our state is one of the worst in the country when it comes to supporting them. Thanks in part to advocacy efforts by CTD and our partners, the lowest paid attendants made $8.00 per hour in 2018, up from $7.86 in 2015 and $7.25 in 2013 (the Legislature made no increase in 2017). While this is a step in the right direction, it's far from a livable wage. Plus, these workers receive no sick leave, no paid vacation, and no health insurance. In fact, the Texas Workforce Commission (TWC) won’t refer jobseekers to this high growth occupation: federal regulations require that job referrals lead to economic self-sufficiency and these jobs do not. Demographic shifts underscore the urgency for a well-supported attendant work force. Texas has the third largest older adult population in the US, totalling 3.1 million in 2014 and projected to increase 90% by 2030 to 5.9 million. Many of these seniors will need attendant support and services in their later years, as do younger people with physical disabilities and/or intellectual and developmental disabilities. With more and more people in these populations opting to age in place or stay in their homes, demand for attendant service will rise. TWC has already has identified personal care aides and home health aides as two of the fastest growing occupations in Texas. The increase in these jobs is projected to reach 102,030 by 2024. As demand rises, a number of economic forces have an increasingly negative impact on the attendant workforce. 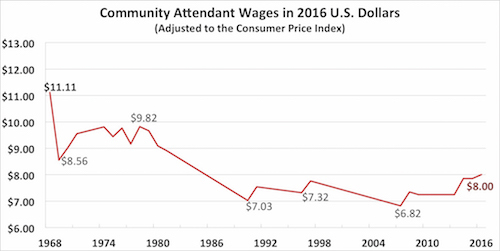 For over 50 years, community attendants in Texas have seen their real wages decline. Wages have not kept up with inflation, undergoing a 30% erosion since 1968 (below). Meanwhile, other entry-level jobs are paying more and even offering benefits, making alternative employment much more attractive. A quick drive around CTD's hometown of Austin reveals that El Tacorrido starts their employees at $13-$15 per hour; Wheatsville Coop at $13.22; Buc-ees at $12-15. With better employment options elsewhere, it comes as no surprise that attendants are leaving the sector. In droves, it turns out: Home Care Pulse reports that the median caregiver turnover rate across the industry was 66.7% in 2017, the highest rate since 2013. All of these factors—a growing population that requires attendant services; decades of wage stagnation; attractive employment options elsewhere; high turnover—put Texas seniors and citizens with disabilities in a very precarious position. A modest wage increase will improve reliability and care which correlates to better health, less acute care, fewer ER visits, and fewer unnecessary institutionalizations. The House has included funds for a 10 cent raise for attendants in their budget, while the Senate has funded NO raise in theirs. Tell key legislators that attendants need a meaningful raise to continue to support the health and independence of Texans with disabilities and seniors. Join the ADAPT of Texas Facebook group for opportunities to advocate for a raise in attendant wages and updates on the issue.